MILWAUKEE (January 28, 2017) – It’s a flat track triple threat. 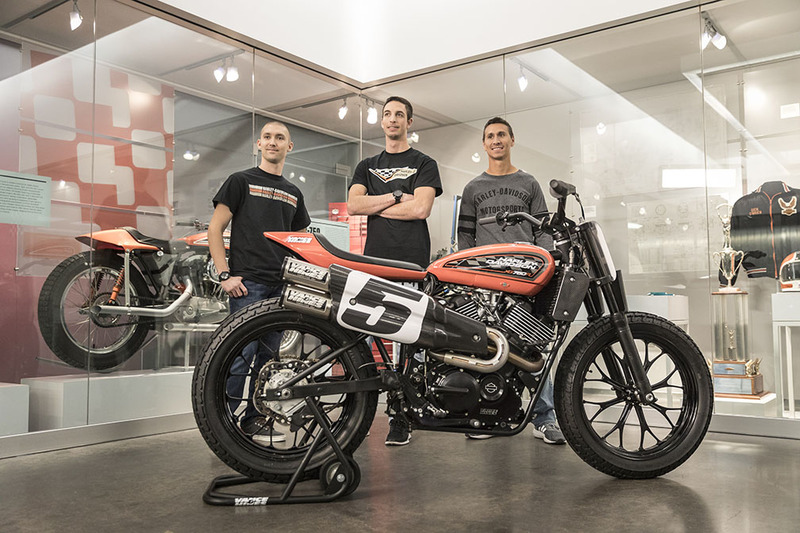 The Harley-Davidson® Factory Flat Track Racing Team will unleash a three-rider squad in 2017. Former AMA Pro Grand National champions Kenny Coolbeth Jr. and Jake Johnson and young flat track star Brandon Robinson will race in the legendary Factory Team leathers. The team was announced today during a live interview with Coolbeth, Johnson and Robinson during ABC network coverage of ESPN’s X Games Aspen. Gunning for the checkered flag aboard the fierce Harley-Davidson XG750R competition motorcycle, the formidable trio of ace racers will chase a championship on the American Flat Track (AFT) series and fight to medal in the Harley-Davidson Flat Track Racing event at ESPN’s X Games Minneapolis. The American Flat Track racing season opens during Daytona Bike Week at the March 16 DAYTONA TT on a new circuit featuring a jump to be constructed inside Daytona International Speedway in Daytona Beach, Fla. The Harley Factory Team will field a fleet of Harley XG750R bikes for Coolbeth, Johnson and Robinson. With a custom chassis purpose-built for flat track racing, the XG750R flat tracker is powered by a race-modified, liquid-cooled, fuel-injected 750cc Revolution X™ V-Twin engine originally engineered for the Harley-Davidson Street® 750, a motorcycle designed for maximum urban maneuverability with rebellious Dark Custom™ attitude. The Revolution X engine is assembled at Harley-Davidson Vehicle and Powertrain Operations in Kansas City, Missouri. The race-modified Revolution X engine and a racing frame for the XG750R were developed in collaboration with Vance & Hines Motorsports. The XG750R flat tracker motorcycle is not a production model. The 750cc XG Revolution X V-Twin engine is for sale through Harley-Davidson dealers today and can be modified for racing use by aspiring dealers and privateers. A three-time AMA Pro Grand National champion (2006-2008), the veteran Coolbeth has won 36 times in the Grand National Championship, more than any active racer in the series. Coolbeth claimed three consecutive titles while racing for the Harley-Davidson Factory Team from 2006 to 2013. Aboard the Zanotti Racing Harley-Davidson XR750 in 2016, Coolbeth won at the Springfield Mile and finished seventh in points. He was named the Rookie of the Year in 1994 and won his first Grand National race in 2002. Coolbeth is 39 years old and lives in Center Hill, Fla.
Jake Johnson won consecutive AMA Pro Grand National Championships (2010-2011) on Zanotti Racing Harley-Davidson XR750 motorcycles and has won 20 times in the Grand National Championship since moving up to the top pro class in 2002. In 2016 Johnson won on the Daytona short track and was fourth in the season standings. Johnson won the AMA Pro Singles class championship in 2006 and 2008 and was Rookie of the Year in 2002. Johnson is 32 years old and lives in Coatesville, Pa.
Brandon Robinson enjoyed a break-out season in 2013 with seven top-five finishes and three victories, including a sweep of both races on the Springfield Mile. In 2016, Robinson piloted the Kennedy Racing Harley-Davidson XR750 to his fourth career victory with a win on the Lima half-mile, notched two additional podium results and finished third in the point standings. As an amateur, Robinson won the AMA Twins Expert class championship in 2008. Robinson is 26 years old and lives in Oxford, Pa. Entering its 64th consecutive season, American Flat Track is the most historic form of American motorcycle racing. The re-vamped 2017 American Flat Track series features 18 rounds of racing headlined by powerful, twin-cylinder motorcycles in the AFT Twins class.